If Christie Can Control The Senate on a Ballot Q, What Can’t He Do? Thankfully, in a refreshing breath of fresh air that suggests NJ media retains a sense of professionalism, news and editorial judgements are holding Gov. Christie accountable for his behind the scenes maneuvers to kill the open space funding Resolution to authorize a ballot question to fund the open space program via dedication of $200 million per year of the sales tax revenue. But four years after taking office and promising to keep the open space program going, Christie has offered nothing, nada, zilch in the way of ideas to get it done. He has to quit the name-calling and come up with something better. Otherwise, the joke is on us for believing he was serious about this issue at all. Unfortunately, while critical of the Gov.’s policy position, they fail to grasp and are missing the larger meaning of the Gov.’s actions. One problem was that some Republicans who previously had backed the measure voted either no or not at all. That was apparently because of a strong lobbying effort by the governor, who was against the proposal. Put aside the messy political machinations that kept the question off the ballot. This was still a bad idea. Exasperating too was the supposed change of heart by some Republicans who had previously supported the measure, but were told by Gov. Christie this time around to back off. And, like good little subservient soldiers, they bowed to Christie’s wishes. This is way past “messy” and “exasperating – it is deeply troubling. If Christie can threaten, intimidate and force democratically elected Senators to reverse their votes in support of the extremely popular Open Space program, at a time when advocates and the entire press corps are closely following the vote, just think what he can do behind the scenes or on lower profile issues, made by bureaucracies (i.e. DEP) or appointed bodies (like the Highlands Council or Pinelands Commission) that are not as transparent as a televised Senate vote. The Senate was considering a Resolution to authorize a voter ballot question to amend the Constitution. Constitutionally, the Gov. has no role at all in this process – the Gov.’s signature is NOT required as it is in enactment of legislation. The Legislature alone controls the process and decides whether to pose the question. And the question is fundamentally a democratic exercise of power, as the voters decide the outcome. That’s why the Gov. abuse of power was so extreme – this was not the typical Trenton political mud wrestling – it was about Constitutional powers and the role of the people. The Gov.’s actions were reprehensible and prove that he is an out of control tyrant. Gov. Christie has made a mockery of democracy, the so called independent branch of government known as the Legislature, and the Constitutional ideas of separation of powers and checks and balances. That’s the real meaning and significance of the Open Space debacle. Adding insult to injury, Christie goes into demagogic attack mode, calling Senator Smith “a joke”. Nine Republicans who had supported an earlier and more costly version of the measure in June did not support the resolution today. Smith said Christie’s staff pressured those senators to back off. “Over the weekend, the governor’s office called every Republican senator and threatened them with their lives — their political lives — and they’re off the votes,” Smith said this morning. According to NJ Spotlight, shore Republicans linked the open space vote with funding for shore rebuilding – suggesting that Gov. Christie threatened them will the millions of dollars he unilaterally controls. 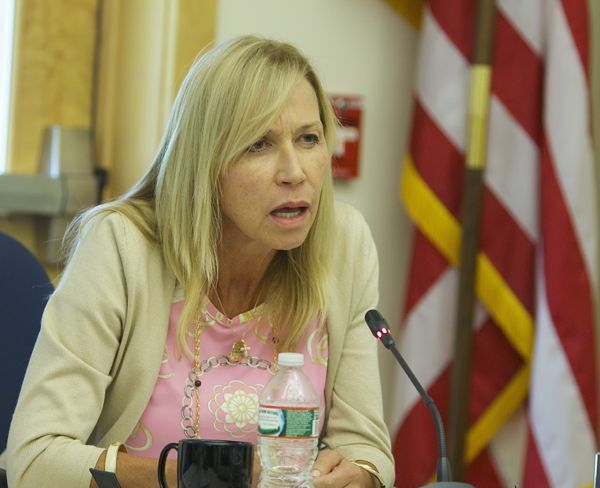 Three Jersey Shore lawmakers yesterday questioned in a press release whether the dedication of the sales tax revenues would jeopardize efforts to rebuild along the coast. All three, Singer, Hozapfel, and Connors, supported the initial sales tax dedication. The Gov. is clearly out of control and must be stopped. And if Christie can so blatantly abuse his powers – so brazenly and openly – what can’t he do? Who will stand up and call the Tyrant out and say enough is enough? [Update: We are now in the theater of the absurd. Two days after Monday’s humiliating defeat, engineered by Gov. Christie’s opposition and threats to Republican Senators, when the issue if effectively procedurally dead this year, NJ Audubon and the Highlands Coaltion (and likely other KIG members) pretend that al never happened and issued an “Action Alert” urging members to CONTACT THE ASSEMBLY! NJ Assembly Must Vote Now for Open Space, Farmland and Historic Preservation!Contact Assembly Leadership and Your Members Today! The New Jersey Senate passed a measure (SCR160) Monday July 29 to sustainably fund open space, farmland and historic preservation well into New Jersey’s future. While the Senate has approved two bills this summer to continue these vital programs, the Assembly has failed to act. 2) knows exactly what they are doing and is intentionally a) deceiving their members and the public; b) avoiding criticizing the Governor; and c) intentionally avoiding a strategic discussion about how to proceed in the wake of this debacle. Obviously, the Senate simple majority vote did not satisfy the super-majority vote required. Therefore, no Assembly vote is required in a special summer session. Audubon’s failure to note that fact is disgraceful. Audubon’s failure to say anything publicly about the Gov.’s action to derail the Senate vote is disgraceful. But, worse than that political disgrace, what is really going substantively is even worse. 2) enact the Resolution by simple majorities in both houses for two consecutive years and put the measure on the ballot in 2014. Audubon does not want any public discussion of option #1. Audubon also does not want to embarrass their friend, Gov. Christie. Audubon is on the same wavelength as DEP, who is downplaying the significance of the Senate vote to protect the Gov. Monday’s vote in the Senate means that amendment will not head to voters in November, even if the state Assembly were to pass the bill by a super majority. I recently wrote a preliminary coroner’s report as a post mortem on the presumed death of the open space sales tax Resolution. But the brain dead corpse was put on life support, while the legislative doctors frantically sought life saving amendments. It is unfortunate that a  51 year old program has died. The program died as a result of un-natural causes. I will characterize the cause of death a result of political malpractice driven by selfishness, cowardice, compromised integrity, poor judgement, lack of analytical skills, and the narrow and elite perspective of the KIG parents. This was a needless and premature death. Due to a structural budget deficit, and billions of dollars of unmet social, infrastructure, and environmental needs, any initiative must generate new revenues. Allocation of funding must be equitable and address urban needs and environmental injustices. The land preservation program must be subordinate to and integrated with climate change policy. There are multiple inter-connections, a discussion of which is beyond the scope of this note (and “forest stewardship” as currently conceived does not include them). The open space program must be based upon and implement a land use plan and regulatory policy. In addition to the serious problems with the sales tax as the financing mechanism, it does not pass the straight face test simultaneously to be promoting development everywhere (including in high hazard shore locations just wiped out by Sandy) with every financial subsidy, regional planning, and regulatory dismantling conceivable and then to argue we need taxpayer dollars to purchase at risk flood prone properties. It makes no sense for DEP to relax stream buffer and wetlands protections and promote new water and sewer infrastructure to serve new development in environmentally sensitive lands by mapping those lands in sewer service areas (thereby dramatically driving up land values), or by over-allocating water supply – and then say we need to preserve environmentally sensitive lands with taxpayer dollars. These are just a few egregious illustrations of the contradictions that must be resolved – there are more flaws, including things like land appraisal value methodology. I say not one more taxpayer dollar to land purchase until the regional planning (i.e. Highlands, Pinelands, and a New Coastal Commission); the DEP program planning; and DEP regulatory tools are restored and invigorated. This would include enforceable reforms so the local home rule ratables chase is restricted from driving up land values and acquisition costs through zoning lands for development that should be preserved. There must be an effort to speak truth to power and hold politicians, government officials, corporations, and institutions accountable for their actions, regardless of their political power or ability to provide favors to the KIG coalition members. And this specifically includes a requirement that they hold this Gov. accountable for the horrible planning and regulatory policy he has imposed that totally undermines sound policy. The KIG coalition will have no credibility unless and until they advocate for a balanced land preservation, regulation, and planning framework that meets ALL of the above conditions. The Senators were responding to extreme pressure, threats, and arm twisting by Gov. Christie. KIG is protecting Christie by exclusively blaming Senate Republicans. KIG does not even MENTION Gov. Christie, despite his political threats and his failure to honor the promise he made during the 2009 campaign to establish a dedicated funding source. 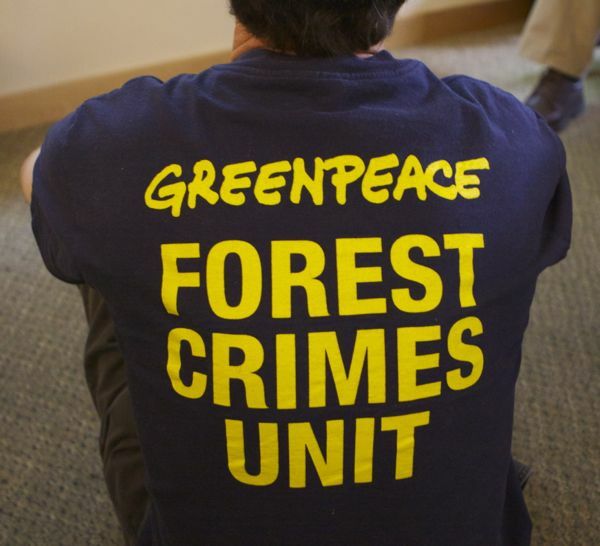 I’ve been meaning to write about this story for weeks, an amazing example of chemical industry greenscam that has flown below the radar for far too long and needs to be called out. Two stories in today’s Star Ledger prompt me to do so. Bear with me and follow the logic, as I connect the dots to show how: 1) chemical industry money; 2) bought and paid for “conservation groups”; 3) passive or captured regulators; and a 4) clueless news media work together to shape issues and focus in a way that betrays the public interest and protects the corporate interest. Similarly, the shift in focus takes us way from considering the 500 chemicals – all unregulated – that DEP has found in NJ’s water supply rivers and away from DEP and water purveyors’ failure to respond to those public health risks (see: Filter the chemical soup in NJ’s drinking water). The shift in focus also takes us away from examining the troubling issue of how the chemical industry’s failure to cleanup toxic sites – there are dozens on the banks and hundreds in the Raritan watershed that pollute the River – impacts our drinking water. And of course, that shift in focus takes us away from thinking about whether DEP enforces the Clean Water Act and stringently regulates the pollution discharge permits for hundreds of industrial plants, municipal sewage treatment, and storm water outfalls. So, the Star Ledger’s “good news” coverage and shift in focus divert public attention away from not only chemical contamination, but also from considering how DEP is doing in enforcing clean water laws and the NRD program and making polluters pay. So, with all these problems masked by the “shift in focus”, one might say, that’s just what the chemical industry – and associated polluters like the pharmaceutical industry – and lax or captured government regulators ordered. Maybe the media would like to look into who is funding the organizations and individuals that are shifting the focus by propagating this propaganda? Which takes me to the second Star Ledger story that illustrates exactly this point. The Auditor reports that the Hudson County Executive has withdrawn a previous letter attacking EPA’s proposed cleanup of the Passaic River. That attack on EPA was prompted by lobbyists for polluters – known as “responsible parties” – who would have to pay to cleanup the mess they made of the river. Oh, and it just so happens that those polluters arranged for $50,000 in funding as an incentive – which essentially amounts to an implicit quid pro quo – or bribe. Back in January, Hudson County Executive Tom DeGise sent a letter to EPA Regional Administrator Judith Enck criticizing her agency’s ideas for cleaning up the polluted Passaic River. The letter was based on a form provided by a consortium of 70 companies that will help pay for the cleanup and want the EPA to use a cheaper alternative. At the same time the companies asked local officials to use their form letter, they encouraged them to apply for improvement project grants the firms were handing out. But last month, DeGise — whose county got a $50,000 grant from the companies — took back his words. 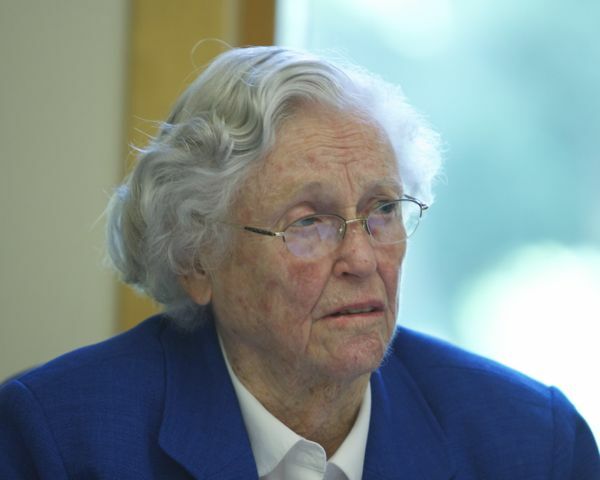 “My letter of January 23, 2013 was written before I understood certain facts about the status of the clean-up and I am rescinding it at this time,” DeGise wrote to Enck on June 11. This is the Jersey Way – and this was just one example. But is a huge anomaly. The vast majority of similar abuses where corporate money – channeled through politicians, government and “conservation” groups – is used to define issues, shape the focus, and buy access and influence are never reported by the media. And the few that are reported, the abuse is rarely corrected as it was in the Hudson County/Passaic EPA case. Which takes me to my final example – perhaps the most glaring and egregious. The Dupont corporation is buying Delaware Bay – the scientific research agenda,the conservation groups issue advocacy agenda, and the media and government response agenda. Ironically, in an Orwellian twist, Dupont is doing all that via a program called “Clear Into the Future” (which just might be a bigger propaganda effort and lie than “Responsible Care”). Let me show you just how Dupont is doing that. Hit the links on that Dupont website and note that the Dupont description of the Delaware estuary, the importance of the estuary, and the threats to the estuary never once mentions chemical contamination – the contamination that Dupont causes and government regulators increasingly tend to ignore. Dupont also fails to provide any information on clean water laws, or government regulation. How convenient – keep the public in the dark on the science and the law. Then hit the links to explore Dupont funding – who they fund and what they fund. Note that again, none of this work involves chemical contamination. In essence, conservation groups are taking Dupont money to work on issues Dupont wants them to work on – which makes them more like Dupont’s private consultants than advocates of the public interest. Dupont’s use of grant money restricts the problem definition such that issues Dupont does NOT want worked on don’t get funded or advocacy. The groups that take Dupont grant money are doing Dupont’s scientific and public relations bidding, just like the effort of the RP’s in the Auditor Passaic River EPA attack and just like the situation on the Raritan. And the government regulators enjoy a pass. And the media is so superficial in their “journalism” that they serve as stenographers for the chemical industry, and might just as well be on the payroll. So, we’ve managed to come full circle – this is exactly what we saw in the industry funded Passaic EPA attack and what we see in the “good news” and “shift in focus” on the Raritan River, where we started this post. So, would anyone in the media or the NJ “conservation community” like to honestly confront this set of issues and break this damaging dynamic of industry propaganda? 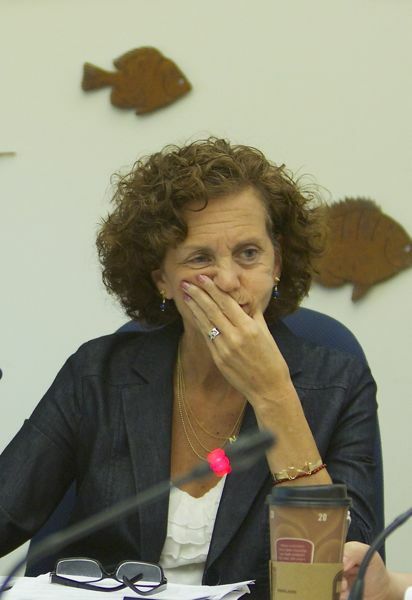 At the conclusion of the meeting, I asked a series of questions of Counselor Roth, forcing her to admit that the Commission had no science, no standards, no criteria, no methodology, no policy, no technical Guidance, and no review procedures for an “equivalence” or “offset” demonstration. When I recently heard of a proposal to build a $65 million 22 mile private gas pipeline through the Pinelands National Reserve to [spend $400 million] to [convert] re-power the B.L. England coal power plant [to natural gas], I thought it was some kind of April Fools joke – or Onion story. [Update: according to South Jersey Gas (SJG), the pipeline cost is now $90 million, a huge increase from prior estimate. Final costs likely to be even higher. No mention of the Pinelands Commission! Aditionally, this statement about the capacity of the project is inconsistent with the BPU presentation, which implied that the pipeline would provide backup fro 63,000 customers, not 267,000! 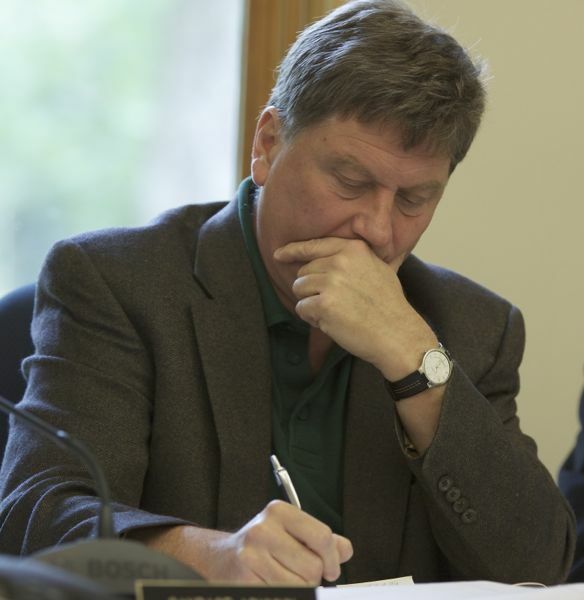 So, without having read the documents, I had to go down to the Pinelands Commission meeting yesterday to hear about the proposal (good news, if I can call it that, is that the route appears to follow existing road right of way – but it was not made clear how much forest disturbance would result – see PPA analysis linked below). Sure enough it’s real – or should I say surreal. I kept expecting to see Jack Nicholson escorted out of the hearing: “Forget it Jake, its Chinatown” (watch that famous scene). Because this one is Chinatown – its all about money, politics, and installing energy infrastructure to fuel more fossil power and drive coastal development. A boondoggle again paid for by the ratepayers. By their own words, the Christie Administration is about to make another huge energy policy blunder – at the expense of the Pinelands and the integrity of the so called “independent” Pinelands Commission – by making political commitments and huge investments of ratepayer money in fossil fuel infrastructure – all while denying climate change and missing a huge opportunity to shift direction to renewable power. 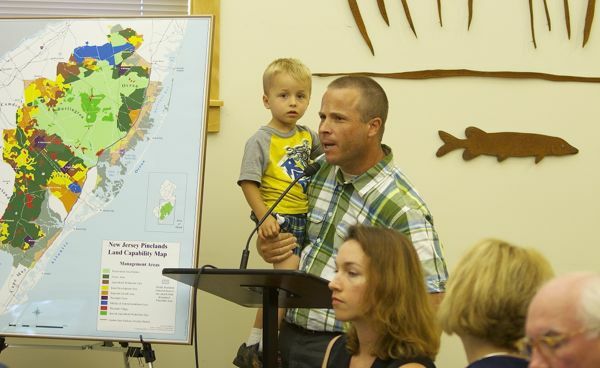 Only the Pinelands Commission can stop it. 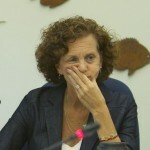 The representative of the Board of Public Utilities (BPU) spoke and responded to the Commission’s questions for almost 2 hours and made the policy and politics driving this pipeline abundantly clear (the BPU spokesman and lawyer arrogantly walked out and left after their marathon, before listening or responding to public comments, which prompted loud angry denunciations from the crowd). The BL England part of the story began with DEP’s 2006 enforcement order that required shut down of the B.L. England Beesely’s Point coal and oil fired power plant for longstanding serious failure to meet air pollution standards and comply with pollution control requirements for NOx, SOx, mercury, and fine particulates. That original 2006 DEP shut down Order was based on traditional air pollutants, not greenhouse gas emissions. But it did include an option, under certain conditions, for the plant to be re-powered. But, at the time it was issued, the expectation was that the plant would close. Plant closure was opposed by local officials and south jersey legislators. And certainly, there was no mention under the original DEP Order of re-powering the plant with Marcellus shale fracked gas from a 22 mile pipeline through the Pinelands National Reserve. But now, in a stunningly hypocritical move, the anti-regulatory, anti-enforcement Christie DEP is spinning to take credit for the air quality benefits of the 2006 Enforcement Order. But at the same time, DEP has refused to enforce it, extended its deadlines, and renegotiated the original 2006 Order last year to pave the way for re-powering and Pinelands pipeline. Worse, ironically they are using a DEP enforcement Order that sought to protect air quality, to be the vehicle to drive a dirty fossil re-powering deal, with dirty fracked gas, via a new pipeline through one of the most environmentally significant places in the state, a national treasure. On top of all that, it was a stringent, nationally leading 2004 DEP mercury emission rule that led to that 2006 Order, a rule adopted under the McGreevey administration (to read the 2006 Order, hit link and scroll to page 37, sorry, this is the only place I could find a copy!). One of the New Jersey’s oldest power plants, B.L. England in Cape May County, will significantly reduce air pollutants by shutting down one of its coal-fired units and converting two others to clean-burning natural gas, steps that will significantly improve air quality while ensuring continued energy reliability for the southern shore region, Commissioner Bob Martin announced today. While ignoring this DEP enforcement history and violations by BL England, the BPU representative’s presentation was astonishing. He began by noting that the Board had issued 2 Orders already this year, approving the pipeline project. These approvals were issued without consultation or participation of the Pinelands Commission (or the public). Although there are conditions of these BPU approvals that require that the project receive all other permits and approvals, its Chinatown – it was clear that the deal is done. To emphasize to the Commission just how done this deal is, the BPU spokesman explicitly linked the Board’s approvals to Gov. Christie’s policy initiatives, expressly making this pipeline a Christie legacy. In a revealing and extensive statement, BPU said that the project was approved by the BPU because it was consistent with Gov. 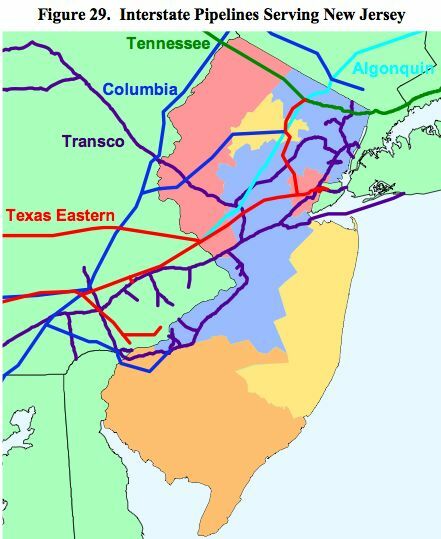 Christie 2011 Energy Master Plan policy that promotes in-state gas fueled generation capacity and expansion of natural gas pipeline infrastructure, especially for South Jersey. 1) BPU admitted that BPU has no regulatory authority over “merchant” generation facilities, no requirement that they demonstrate a need, and consideration of energy alternatives. Merchant generators sought and were driven by profits, not sound energy policy and BPU had no role or power in any of that under energy deregulation. 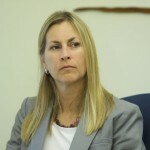 Left unsaid was that this market chaos is the legacy of Christie Whitman’s energy deregulation legislative initiative. 4) BPU held out a fig leaf by concluding the project was justified by the need for “reliability” and redundancy in the south jersey gas infrastructure supply. This surprised the Commissioners, who thought that the pipeline would be dedicated exclusively to the B.L. England power plant. 5) The pipeline is an intra-state pipeline under the control of NJ state officials. This is very different from the north jersey gas pipelines, which are under FERC jurisdiction and FERC can pre-empt any NJ efforts to block them. In fact, DEP has held out the possibility of FERC preemption as an excuse for sweetheart State land lease deals and rubber stamped land use pemits DEP issued. 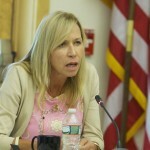 The BPU spokesman made a series of contradictory, questionable and/or vague assertions on several important issues and unknowns regarding the capacity the 24 inch pipeline; how that capacity was allocated; how it was paid for; how it could enhance “reliability” for 63,000 gas users in Cape May; and why, if this “reliability” was so critical, the BPU had not mandated that South Jersey Gas Co. install it years ago. What does “equivalent protection” mean? Is an “offset”, a political deal or a science based public policy? Just Say No to MOA! The Pinelands board is facing a situation not unlike when it granted permits for Conectic (sic) to build a power line west of the Garden State Parkway in southern Ocean County, and as part of the agreement got $13 million from the power company to buy land for preservation. Such “offsets” could be part of any agreement on the natural gas line, but “we’re not prepared to discuss that,” said Stacey Roth, a lawyer for the commission. But, under Commission regulations, a MOA is limited to public agencies – as Commissioner Ed Lloyd noted during the meeting when he questioned Ms. Roth on how the BPU could be considered the applicant, when the pipeline was a project initiated by a private energy company, South Jersey Gas. Chief Planner Grogan - professionalism or politics? I suggested that perhaps work on developing and adopting a science based offset policy should preceed an ad hoc review of the pipeline project. During my testimony, I questioned the trustworthiness of pipeline company engineers and mentioned some of the risks of pipelines in light of recent problems in Vernon, and the washout that destroyed Lake Lookover, and sinkhole collapses in Montague and Louisiana. 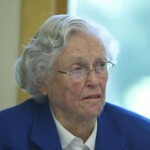 Commissioner Ashmum - longtime member, reappointed by Christie. Will she allow a pipeline deal to taint her legacy? Would you risk the public’s water supply for a business deal? If you say Yes to this, what can you say no to? 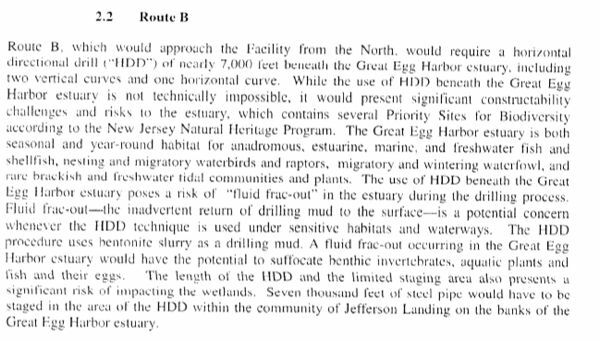 [Update: Curiously, South Jersey Gas Co. engineers concluded that horizontal directional drilling under Great Egg Harbor would pose unacceptable risks – someone should tell DEP this, because DEP is allowing drilling under the Wanaque Reservoir! Having spent many years – both as a DEP staffer and later in the environmental community – fighting various boondoggle incineration technologies, I heard echoes of the 1980’s in some of the “biomass” described in Tom’s story. Frankly, I thought we won those debates during the Florio Administration, when capital intensive, high cost, and highly polluting incineration was discourage and classified as “a technology of last resort” in the State Solid Waste Management Plan. Instead of disposal technologies, the priority was source reduction – reduce the amount of waste and materials used – and reuse. After those options were exhausted, then recycle and compost what was left. Dispose of a small fraction of residuals left over. That was the policy hierarchy. It seems that Florio policy is only made stronger by climate change, and the imperative to reduce GHG emissions. But, that was 20 years ago – and the vendors of crazy never give up, and simply repackage technological boondoggles with new marketing slogans like “biomass”, “sustainable fuel”, and “renewable energy” (given the same subsidies as solar and wind). All this raises the specter that the “forest stewardship” initiative will include renewable energy subsidies from BPU “biomass”, thus promoting the cutting our forests as a source of “biomass” fuel (see: Will NJ Forests Bend Over for Biomass?). On top of all that, a bill sponsored by Assembly Chairman Chivikula would provided Class I renewable energy subsidies to biomass (see: Assembly Committee Redefines Renewable Energy – Bill would extend ratepayer subsidies to some technologies based on fossil fuels). So, I hit a few links to the BPU Biomass program, and sure enough, a bunch of BPU “stakeholders” (no environmental or public interest representatives in the room) – along with DEP – are quietly developing regulations (i.e. 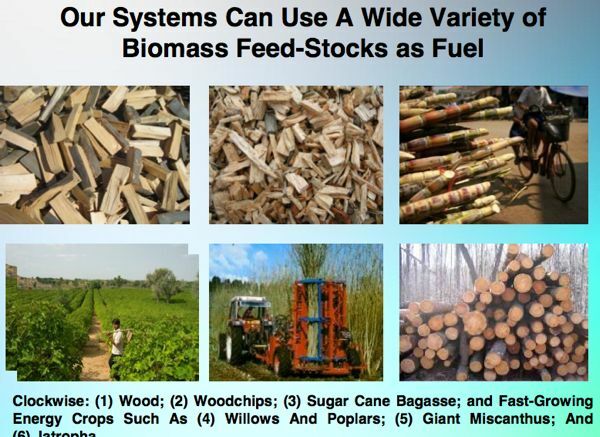 “biomass sustainability” determination and “state of the art” air pollution controls) to promote garbage incineration, garbage “gasification”, and various “biomass” combustion technologies and fuel sources that include forests. This is really disturbing, particularly considering that the man heading up the BPU initiative, my former colleague Mike Winka, actually took a strong stand in regulating incineration projects in the 1980’s while at DEP. Mike’s integrity was rewarded by DEP management by basically taking his job away and installing a yes man in his place. So, Winka gets it, which makes the current effort to revive these incineration boondoggles all the more troubling. Just take a look at this “waste to energy” presentation – it’s basically modular garbage incineration and explicitly mentions “unsorted, unprocessed municipal and industrial solid waste”. Even if you didn’t care about environmental aspects, note that the technology proposes to produce gas from garbage. With the dirt cheap price of natural gas right now, that high cost gasification technology can not be economically feasible, so why are BPU and DEP even considering providing subsidies and developing regulations to promote it? BPU and DEP would take us backwards 30 years, call it renewable biomass and give it taxpayer renewable energy subsides – just like solar and wind get. ABSURD. 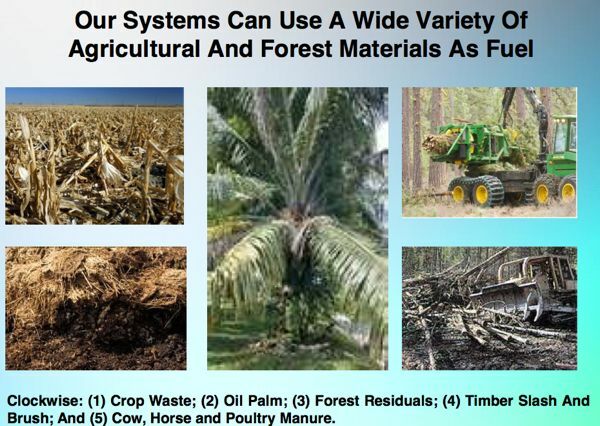 Check out this “Agripower Inc.” presentation – they present mobile incineration units to go to the fuel source, including our forests! Well timed for implementation of the “Forest Stewardship” bill – oh but all that is just a coincidence, right? Please, please wake me up and tell me I’m just in a 1980’s nightmare, right?